Combine a modern design with fantastic service in a cozy atmosphere and you*ll have the Homewood Suites by Hilton Davenport hotel. Located off I-74 in the center of the Quad Cities you*ll be close to whatever you might need from UnityPoint Health-Trinity Pain Clinic to Aramark Corp and even the Isle of Capri Casino. Spend the day in Davenport for business or leisure and be sure to return to the hotel for our complimentary evening social* available Monday through Thursday. Sleep in and enjoy a full cooked breakfast included in your stay. 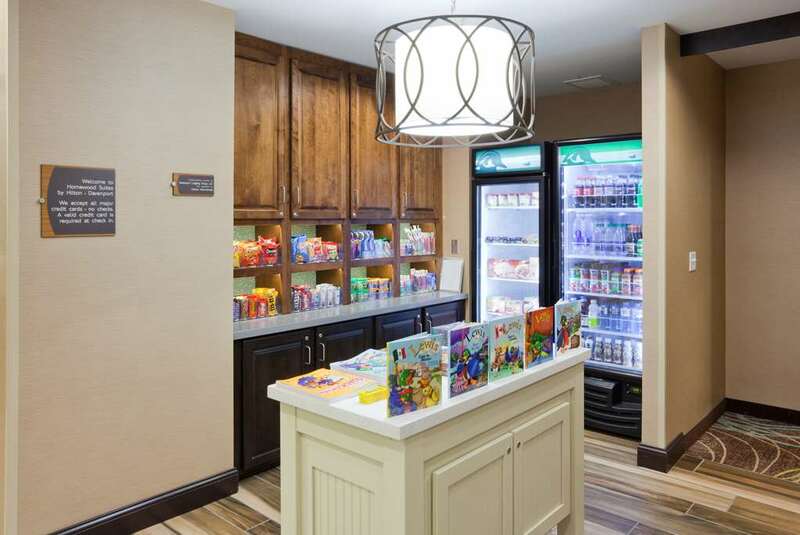 Our new hotel is built with the latest Homewood Take Flight amenities and design. Explore the local area or stay around the hotel enjoying the heated indoor pool and spa. Stay committed to your workout plan in our well-equipped fitness center offering treadmills ellipticals recumbent bikes and various strength training equipment. Get in a quick game of basketball with friends and colleagues on the outdoor court. Gather the family together for movie night in your spacious suite with a movie and snacks from the lobby Suite Shop. *Local and state laws apply.